There’s a lot more to wearing a see-through dress than at first meets the eye. What a girl intends to show through the see-through for instance. Ever since the see-through craze started in London, Carnaby Street artist Audrey Watson has been rushed off her feet – designing instant paint-on bras. It’s a pretty ticklish business as 24-year-old Audrey paints her bras straight onto the customers skin. And, since she started débutantes and office girls have been flocking to the Lady Jane Boutique where she works, to bare their bosoms for a multicolour, exclusive, painted-on picture. Audrey, who quotes her prices as: “10s. 6d. a half; from 3 to 10 guineas for a whole body,” will paint on anything from just patterns to faces, street signs or mock tattoos. “I’ve even done a whole street scene right across, complete with red London buses,” she said. Audrey, who has tried painting with everything from greasepaint to ink, says it takes skill as most things crack on skin. She is now experimenting with Tempera, powder mixed with egg white like the Renaissance painters used, but she mainly works with Leichner and coloured inks gently powdered over. “It isn’t dangerous as not enough of the body is covered up, and it comes off with cold cream,” she says. Does Audrey herself wear a see-through? 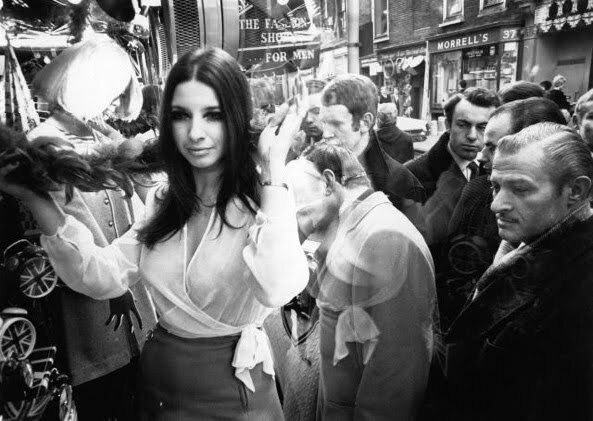 The Lady Jane boutique maintained something of a reputation for shock value; see-through clothing, body paint and scantily clad models in the windows were staple gimmicks throughout the late Sixties and early Seventies. Some things never change, do they? I have the crazy desire to do this. What a fascinating post – amazing photos of this curiously arty craze (and phase).. I also would love to do this it looks rather awesome, but they'd need quite a bit of paint to cover mine!!! I would love to be brave enough to try this–the bras in particular are great.